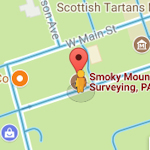 Smoky Mountain Land Surveying is based in Franklin, NC, and offers a variety of surveying services in Franklin, Cashiers, and throughout Western North Carolina. Our field surveying crews work primarily in North Carolina’s seven westernmost counties – Macon, Jackson, Clay, Graham, Cherokee, Swain and Haywood. Should you have any questions as to where we provide surveying services or about your surveying questions & needs, please do not hesitate to contact Smoky Mountain Land Surveying here or via telephone at (828) 524-3668. We’ve provided an overview of the surveying services which are available though our office. A measurement of the perimeter boundary of a parcel of land according to the description in the recorded deed along with property corner and property line evidence found in the field. A boundary survey includes any improvements along the boundary, such as fences, drives, utilities, buildings, sheds, streets, etc., affecting the use of or title to the property are located, missing property corner markers are replaced. A map showing the boundaries and improvements along the boundaries is prepared. Occasionally, we have property owners who simply want the location of their corners and property lines verified and staked prior to the placement of some improvement along or near their boundary. In these cases, a landowner might feel that a formal survey plat is an unnecessary expense and we tend to agree. As a result, the field survey is performed with the same attention and care as previously described. The only difference here is that a formal survey plat showing our completed work will not be prepared. All data collected during the field survey and public records search is retained in our files for future reference. View sample Boundary Survey Plat. 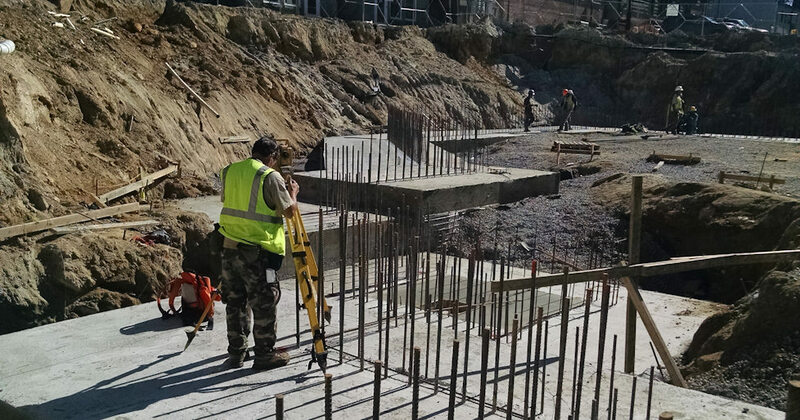 A survey locating the foundation walls of new construction. Many lending institutions require the owner or builder of new construction projects to provide a survey plat showing the location of the building under construction, prior to framing operations, as it relates to the outside boundaries of the parcel on which it is being built. A boundary survey with the additional location and mapping of all the interior improvements. Many of the boundary surveys we perform could also be classified as location surveys. These surveys show the major improvements to the property such as buildings, fences, walks, drives, wells, utility lines, etc. This type of survey may be required by a lending institution or title insurance company related to the acquisition of a loan. View sample Location Survey Plat. A survey similar to a location survey. An As-Built survey is often required by a lending institution, architect or engineer to insure that the designed and permitted improvements have been installed in the correct location and if not, to provide the actual location of the new improvements. These improvements could include residential or commercial structures, underground utility lines, storm water measures, roadways, curbing, etc. View sample AS-BUILT Survey Plat. A survey locating property improvements and topographic features such as contour lines, spot elevations, roads and embankments, water courses, ditches, utility lines, etc. A topographic survey is most commonly requested by a homeowner, property developer or design professional prior to planned site development activities. The site data needed to produce this Topographic Survey can be collected by us in the field with conventional survey and/or GPS equipment or by the use of contracted services for Aerial Photogrammetry Mapping. This last option gives us the ability to economically map a much larger parcel of land with mass data collection methods supplemented with conventional measurements where site conditions make aerial data collection difficult. View sample Topographic Survey Plat. A survey where a parcel of land is divided into two or more residential or commercial building sites. This survey utilizes the Boundary Survey and Topographic Survey, if necessary, to design the best use of a parcel of land as it is divided into smaller tracts or building lots. The location of system roads and access drives are incorporated into this design so that the newly created parcels will have the best and safest vehicle access possible. Since many of the counties we work in have ordinances that direct the subdivision of land, we are experienced in the navigation of this sometimes complex surveying process. View sample Subdivision Survey Plat. A survey using conventional or GPS technology to stake out buildings, roads, walls, utilities, etc. This surveying service is used by homeowners, builders, utility contractors and road construction and paving companies to stake out the horizontal and vertical locations of planned improvements. A survey using highly accurate GPS receivers to collect field survey data. Survey grade GPS receivers track an orbiting constellation of satellites to accurately determine the position of points on the earth’s surface. The x/y/z coordinate data generated by this technology allows us to determine the actual geographic position of a parcel of land or to locate and map property corners and land features needed for the various types of surveys. While GPS technology is a valuable tool for the collection of data, it is not the primary way we survey and map properties. Due to overhanging tree canopy and other site features that might degrade a GPS signal, getting reliable results is sometimes difficult and time-consuming, if not impossible. Reagan’s words “Trust, but verify” apply to the use of GPS data collection as well. Trust the technology but verify the results. An unchecked GPS value is worthless when its intended use is for accurate horizontal or vertical positions. Due to the inherent limitations of this technology, our primary use of this equipment is for the establishment of survey control points on larger boundary and subdivision surveys. Its use for routine data collection on smaller projects is increased during the winter months during leaf-off conditions. A very detailed survey often required by lending institutions and land title companies. An ALTA survey is a boundary survey prepared to a set of minimum standards that have been jointly prepared and adopted by the American Land Title Association and the American Congress of Surveying and Mapping. An ALTA survey shows property improvements, easements, rights-of-way, and site features impacting the project site. An ALTA Survey is often prepared for larger commercial properties, providing the lending institution with the information needed to insure the title to the land and improvements to the high degree that a commercial development might require. View sample ALTA Survey Plat. A Flood Elevation Certificate is a document generated by an engineer, surveyor, or qualified person that will provide data to help properly rate properties for flood insurance. The flood elevation certificate can determine where your home is located in relationship to the Base Flood Elevation. If you are in or near a flood hazard area, your lending institution may require an elevation certificate. Similarly, if you are planning a building project or addition to your home and you are in or near the flood hazard area, you may be required by the county building inspection department to obtain an elevation certificate prior to the issuance of an improvement permit.